The Kosmopolit was the second typewriter built by the Guhl & Harbeck sewing machine company of Hamburg. 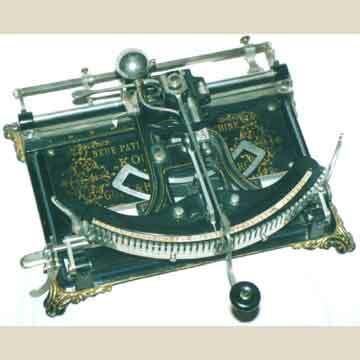 The base of the Kosmopolit is the same as on the earlier Hammonia, but the index is now semi-circular, and the machine operates the same as the World typewriter, with a the type placed on a rubber sheet. The large index pointer is turned pushed down to print. The type strip was fitted in the open frame that is clearly visible on the left in picture 3. Paper was fed into the machine from the front and gradually rolled backwards, where it slid under the rear guide rail. The characters were placed in alphabetical order, and not, as on other machines, placed in groups that are often combined. The machine is very rare.